After one round of voting, the field has been narrowed down to 8 moments! Vote for your favorite highlight from each matchup! Voting for round 2 will close at the end of the day on July 25. 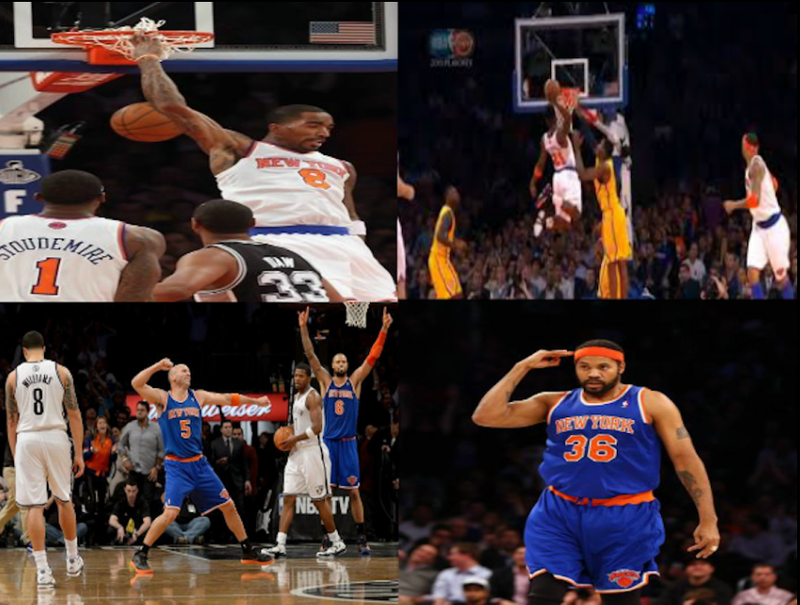 #1 Knicks crush Heat on opening day after Sandy, Sheed hits first 3. Analysis: With the emotions, the opening night atmosphere, and the Sheed moment, the #1 seed is the favorite here. But even though Miami sat their starts the night that Carmelo scored 50, the #6 seed has a chance to pull off an upset. Analysis: The JR slam was astounding and electrifying. The look on Charles Barkley’s face during that Heat game was priceless. This could go either way. #3 JR Smith hits 2 buzzer beaters vs Charlotte, Phoenix. Analysis: 2 is better than 1. But the Nets are better than the Suns and Bobcats combined, so this is a tough call. Those are your matchups for the Knicks Highlights Quarterfinals! Cast your votes (and spread the word) before voting ends at the end of the day on July 25! This entry was posted in Articles and tagged ball don't lie, carmelo, Carmelo Anthony, Charles Barkley, iman shumpert, iman shumpert dunk, J. R. Smith, jason kidd, Kenyon Martin, knick, KNICKS, knicks 2013 highlights, knicks beat heat, knicks best plays, Knicks highlights, knicks highlights tournament, knicks memes highlights, knicks memes highlights tournament, knicks memes top moments, knicks memes top moments tournament, knicks season plays, knicks top 10, knicks top moments, knicks top moments bracket, knicks top moments tournament, kurt thomas, kurt thomas 3, Miami, New York Knick, new york knicks, pablo prigioni, rasheed wallace, STEVE NOVAK, steve novak floater, tommy knicks memes, Tommy Rothman, tommy rothman knicks, tommy rothman knicks memes on July 24, 2013 by Tommy Rothman.